Your electric fencing system is only as good or as bad as your cattle water system. Pasture fences and livestock water are the two interdependent halves of your grazing plan - one cannot work effectively without the other. Part I and II of this article series explained how to set up the broad permanent fence corridors that provide the skeleton-structure of your grazing rotation. Part III and IV explained how to use temporary portable electric fences to subdivide these corridors into flexible daily grazing slices to create your pasture rotation. In this article I am going to show you how to integrate your cattle water system into your electric fence grid so that every slice of your pasture rotation, no matter how large or how small, has access to drinking water. Flexible pasture slices require a flexible cattle water system. With so many tiny pasture slices that vary constantly in location and size, it is simply not feasible to build individual permanent water sites in every pasture slice. 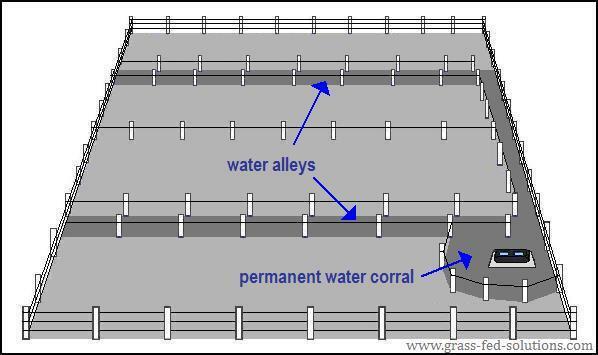 You either have to build livestock water alleys for your cattle to walk back and forth between their pastures and permanent central water sites or you need to build a mobile cattle water system that is able to provide your cattle with water as they migrate through your pasture rotation. In the discussion below I will show you how to integrate each of these two cattle water systems into your fencing plan. 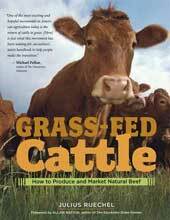 After you finish reading this page, I also recommend exploring the Livestock Water section of the website, and the "Livestock Water" chapter of Grass-Fed Cattle to explore different cattle watering options, water pumping solutions, water piping considerations, winter watering options, and the extensive selection of water storage and collection strategies to suit a wide range of climates and pasture conditions. Use the three links below to review previous steps in the Fence Planning and Installation process. Water alleys to central water sites. Or, a mobile water tub. This mobile trough is supplied either by connecting to a water pipe grid or by using a mobile pump to draw water from open water sources accessible alongside the pasture rotation. Which cattle water solution you choose will ultimately depend on the kinds of water sources and pumping solutions that you have available to you and whether your soil is firm enough to prevent damage to pastures if your cattle are accompanied by a mobile water trough. I'll discuss each option separately below, but the key take-away message is to plan your entire cattle water system ON PAPER before beginning construction on your fence infrastructure. Fences and water need to work seamlessly together to create an effective pasture rotation. The example farm plan provides an example cattle water system as part of the farm plan map overlays. If you choose to walk your cattle to a central water source during the growing season, you do not want your cattle to traverse back across previously-grazed pastures, as I explained in the article about the daily pasture rotation. This means you need to build alleys to connect your pastures to your water sites. Build cattle water alleys along every second permanent electric fencing corridor so cattle can access water from anywhere in their pasture rotation. Single-wire interior fences allow you to use swivel-lock insulators to create temporary gates from anywhere in your pastures to access the cattle water alleys. The wide electric fence corridors discussed in Part I of this article series will only require a minimal number of water alleys to ensure that every single pasture slice in your rotational grazing program has access to water. Only every second permanent fence-line will require an alley, as shown in the image above. Build all your interior fences and water alleys using single-wire fences combined with swivel-lock insulators. This combination allows you to easily create temporary gates on demand anywhere in the alley fence as you need them instead of having to build endless permanent gates to access the water alleys. Swivel-Lock Insulators - How to create instant temporary gates anywhere in your electric fence grid to access your cattle water alleys. Livestock Water Corral - Construction tips for building a centralized water site for your rotational grazing program. The most common method of creating a portable cattle watering system for your rotational grazing program is to use a mobile water trough that is connected to a network of polyethylene pipes, which are laid out underneath your electric fencing network. The pipe grid has a series of quick-connect couplings installed so the water trough can follow along with the cattle herd during their pasture rotation. This mobile cattle water system, outlined in the image below, is extremely flexible and allows you to easily deliver cattle water to every single part of your rotational grazing program at a minimal cost. 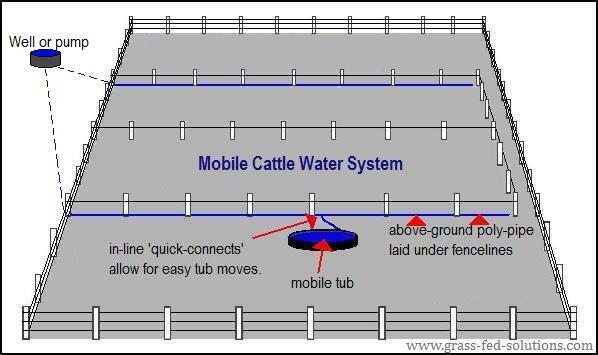 Follow the link to see the example farm plan, which uses this mobile cattle water system. The most common portable cattle water solution is to use a portable cattle water tub that connects to a network of polyethylene pipes, which are laid out underneath every second permanent fence corridor. Follow the link to learn how to construct your own portable cattle water system and polyethylene pipe network. If you have ditches, streams or other water courses that run alongside your rotational grazing program you can also create a mobile water trough for your rotational grazing program by pumping from the water source using a hydraulic-ram, solar, or stream-driven pump, or by using a gravity-fed water line that is fed from a water-source further upstream. The trough can either use a float-valve to stop water flow when the trough is full or you can create a continuous flow scenario where overflow is piped back into the watercourse. Mobile Cattle Water - how to build your own mobile livestock water system for your rotational grazing program. How to calculate daily water requirements for each age group in your cattle herd. How to calculate peak demand when sizing water flow rates at the trough and when choosing the correct water trough capacity (tub size) for your herd. A simple trick for calculating and monitoring flow rates at your water troughs. How to calculate pressure losses caused by friction in pipes to help you choose the correct pipe diameter when piping water over long distances (includes simple formulas and handy quick-reference tables). Simple formulas to calculate pressure gains and losses caused by gravity when piping water across sloped surfaces or if you use a gravity-fed water system. How to build a polyethylene water grid with quick-connect couplings for your mobile water trough. How to build centrally-located water sites and water alleys to allow cattle to travel from pasture to water from anywhere in their pasture rotation. How to create gravity-fed water systems that won't air-lock. How to create direct-access water sites at ponds, dugouts, and watercourses that are designed to prevent excessive manure contamination and are resistant to trampling damage at the water's edge. How to create water harvesters for dry climates where groundwater is not available. How to create dugouts and ponds to collect runoff or to access ground water. You will also learn how to create a water-proof layer at the base of your dugouts using either pond liners or natural gleization strategies to retain water even if your dugout is built on permeable soils. An overview of a wide range of water storage options. 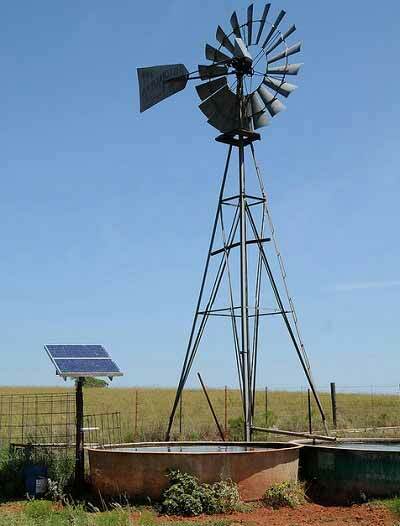 Learn about a wide range of pumping solutions when electricity is not available - wind, solar, hydraulic ram, stream-driven, and even animal driven. A range of frost-proof livestock watering options using both electric and energy-free livestock waterer designs. If you live in a frost-prone region, you will also need to plan a separate frost-proof cattle water system to mesh with your winter grazing strategy. Luckily, designing a frost-proof cater water system for the winter months is extremely easy because winter grazing requires an altogether different but much simpler grazing strategy than grazing during the growing season. You can explore these winter pasture management principles and winter grazing techniques in the article about intensive grazing strategies for the winter months. The two remaining articles in this Smart Electric Fence Grid series explore the hands-on practical side of winter grazing - how to build a frost-proof cattle water system that meshes with your winter pasture rotation and how to overcome the challenges of maintaining sufficient electricity in your fences during the winter. Part I - permanent electric fence corridors (planning). Part II - permanent electric fence corridors (construction tips). Part III - portable electric cross-fences (planning). Part IV - portable electric cross-fences (construction). Part VII - winter electric fencing tips. Mobile Cattle Water- how to build your own mobile livestock water system for your rotational grazing program. Cattle Water Requirements - How to calculate daily livestock water requirements and peak demand flow rates. Livestock Water Corral - Construction tips for building a central water site for your rotational grazing program. Example pasture rotation and farm plan - Farm maps with a step-by-step explanation of fence layout and grazing strategy. Browse through the livestock water article index on the Livestock Water main page. Or, return to the article index on the Electric Fencing main page.